We have another twelve crabs to cook and pick from our two days of crabbing here in Cannery Cove. We may not be catching many fish yet but we sure are getting our fair share of crabs. 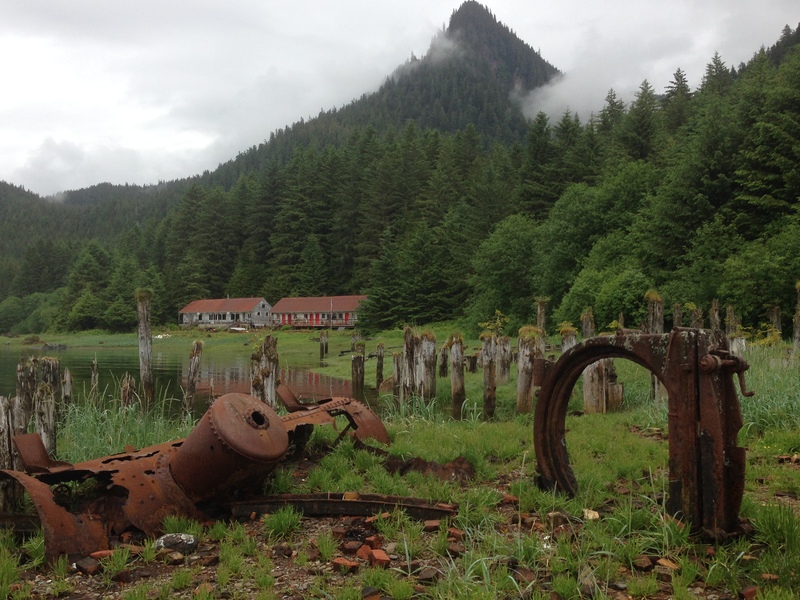 We decide to travel only a short distance today to another anchorage on Admiralty Island. It’s a wonderful day on the water with gorgeous scenery and calm water. 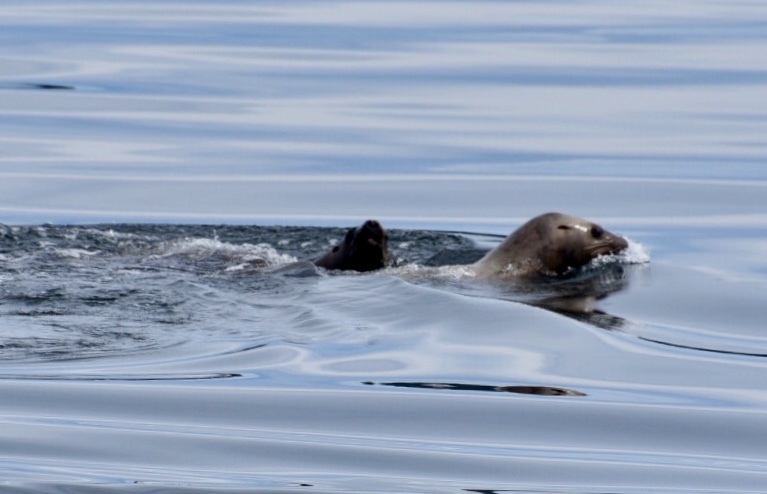 We soon spot a group of sea lions feeding on a school of herring. We decide to stop also and try again for a halibut along a sandy patch. We catch a small cod within minutes of putting out the lines. Soon after a small rib approaches our stern. There are two Alaska State troopers aboard checking fishing licenses. They were very nice and informative. We had heard that you are not allowed to chunk up a halibut while still on the boat. Our question to them is how this is handled for someone living aboard. They said these federal rules apply to any boat with fishing gear. The rule states “ No person shall possess on board a vessel used for fishing halibut that have been filleted, mutilated, or disfigured in any manner, except that each halibut may be cut into no more than 2 ventral pieces, 2 dorsal pieces, and 2 cheek pieces, with a patch of skin on each piece”. Each person can possess only the two daily bag limit. If we catch a big halibut, I am not sure how we would be able to fit these big pieces into our freezer. Guess we will worry about that once we catch one. We travel a few more miles into Gambier Bay. After working our way through a maze of small islets, we are rewarded with another lovely anchorage in Snug Cove. Later in the evening, we spot our first grizzly bear wandering the mud flats. He is over a mile away so we weren’t able to get a good photo but being this far away he poses no danger to us. Dawn comes early here in SE Alaska. We have full morning light by four AM. We enjoy our morning coffee while watching a deer and four eagles exploring the low tide mud flats. This week there are some extreme tides reaching over twenty feet between high and low. Local predators take advantage of this to feed on sea life not normally exposed by such low water. We were also told that the fishing would not be good during these extreme tides. Maybe that’s why we are having no luck with the Halibut fishing. We continue our journey north along Stevens Passage along the eastern shore of Admiralty Island. We are fortunate to again have calm seas. The Sawyer Glacier is impressive even being a great distance from us. 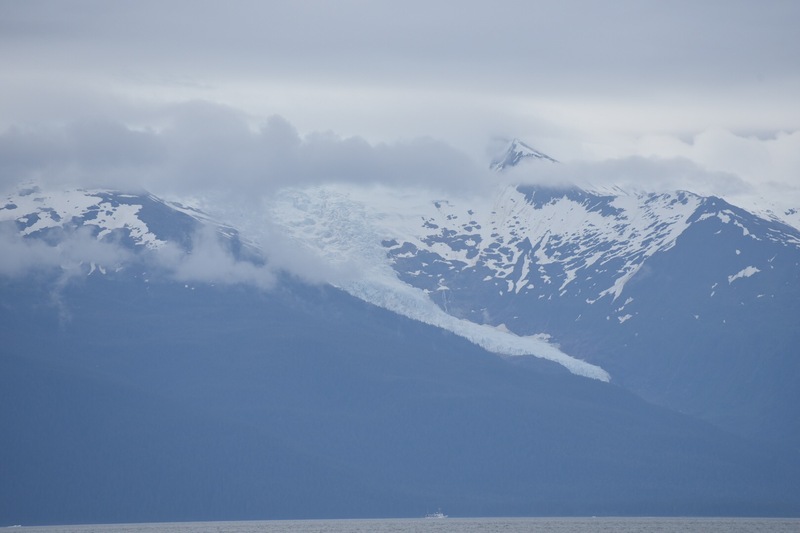 We hear the NatGeo Seabird Cruise boat as she heads up Tracy Arm to visit the glacier. We are not yet brave enough to visit this one. It is rumored to have lots of ice bergs along the channel and some serious calving at the glacier. Maybe next year! Taku Harbor is our stop for the evening. The city of Juneau has placed a floating dock here in the cove for boaters use. It doesn’t have power but it is free to use on a first come first serve basis. We are in luck today as there is plenty of room for Idyll Time. Taku, named after the Tlingit tribe that once lived here, was at one time the site of a Hudson Bay trading post. 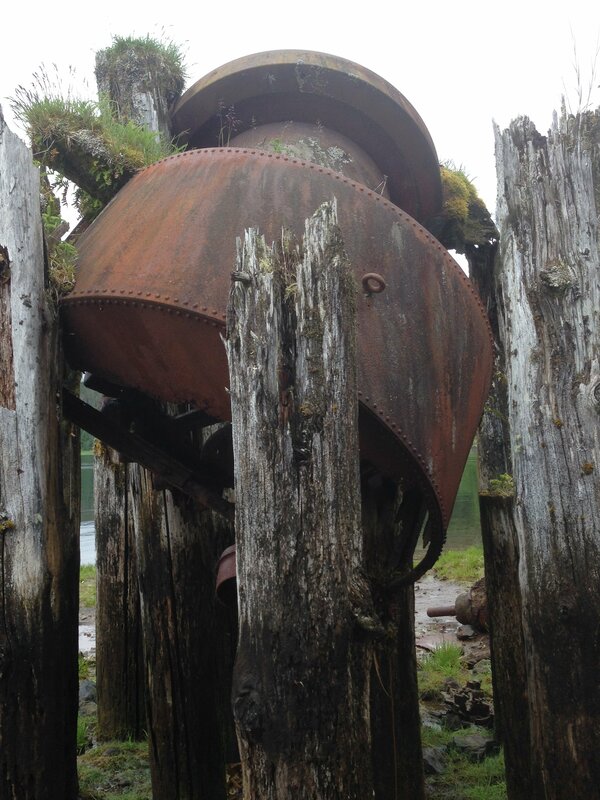 Today the only thing here are the ruins of an old cannery. Jeff explores the old cannery walking around the old piers and rusting remains of cannery machinery. With lots of brown bears in the area, Susie decides to enjoy the afternoon in the warm pilot house planning our next few ports of call. 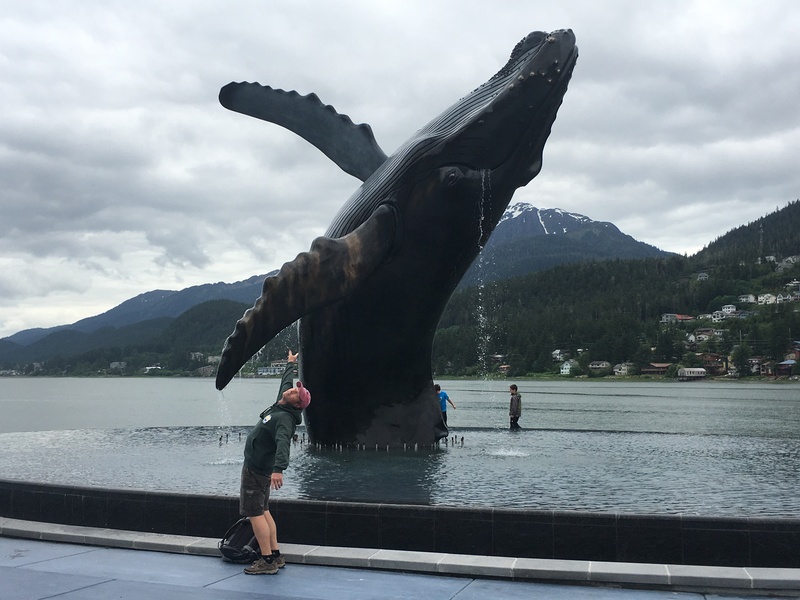 It is a short 22 miles to Alaska’s Capitol city Juneau. Entering the ten mile long Gastineau Channel, we see two hugh cruise ships berthed downtown. The marinas in the heart of town are all full so we are assigned a slip in Douglas about two miles outside town. The marinas here in Alaska don’t take reservations. You just have to hope their will be a slip available when you get there. We arrive to the harbor breakwater and are amazed by how low the tide is today. Checking the tide tables, we are at five feet below mean low water. A quick call is made to the marina asking about depths in the harbor. The dock master “thinks” we will have enough water to get in. He says to stay close to the docks as we work our way to the transient face dock. After circling for about ten minutes we cautiously ease our way into the harbor with a few feet under our keel. It looked much worse than it actually was. We are happy to be in Douglas away from all of the cruise ship craze. Jim and Amy on the Krogen 42 Rekindle are here also. Our only reason for stopping in Juneau is to pick up our spare diesel heater pump that Philbrooks had repaired and shipped here for our pickup. We take advantage of the stop to re-provision and get a much needed hair cut. The bustling downtown waterfront is packed with cruise ship passengers shopping for Alaska memento. This is not our cup of tea. We are happy to catch the bus back over to our quite marina in Douglas. We will start working our way to Sitka tomorrow. This entry was posted on July 9, 2018 at 4:04 pm. You can follow any responses to this entry through the RSS 2.0 feed. You can leave a response, or trackback from your own site.